I first met various James sisters at a health expo a few years ago, where I was tabling for my personal chef business, Fresh Chef Detroit and their big logo mirror for Drought struck me from across the way. Relatively new to juicing at the time, I made it a point to head over and have a chat. We’ve continued to cross paths in the years since and they have done nothing but impress me — as sisters (who clearly work well together), women and entrepreneurs. They’re doing it right. My family cannot get enough of their juice. We moved dangerously close to Drought’s Royal Oak location right about the time it opened. Here’s the video, produced by Gentlemen. A few years back I attended a screening of the movie May I Be Frank and Door to Door Organics had a table there. I had heard of them but never used them — the discount code I was given that night made me give it a try. I’ve used them on and off since (you can suspend your order anytime — one of the many bonuses to using them). I’ve recently started up the service again and I’m so glad I did — it makes my Mondays so much easier! 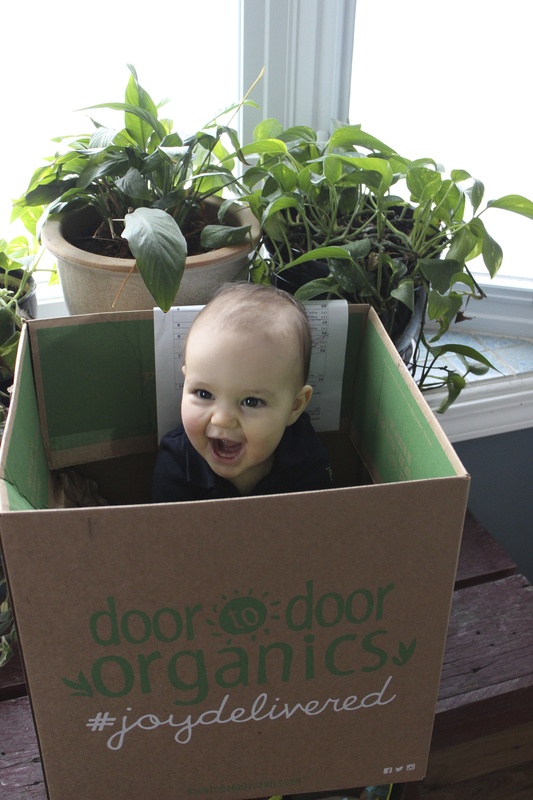 If you’ve never heard of Door to Door, you should visit their site to see if they deliver to your area. You pick what size box you want, whether you want fruits, vegetables or a mix and how often you would like to receive a box. I used to get a small mixed box every other week. Now I get a “bitty” mixed box every week. Here’s how it works. A few days before your delivery day, you get an e-mail with your weekly order. If there are things on there you don’t like or know you won’t use, you can swap them out! You can also add all kinds of things to your order in addition to produce, including items from local bakeries and businesses, meats (if you’re into that kind of thing), fish, dairy, crackers, Almond milk and so much more. The website has recipes that are really helpful and they regularly have little coloring contests for kids and other fun things they do. Customer service is amazing. When I was pregnant I went through a mango phase. My box showed up and my mangoes were all brown and funky inside. Not only did they immediately e-mail me back when I contacted them, they threw an extra mango in my next box for good measure. I know it sounds like they must be paying me, so I must say I have zero affiliation with them other than being a customer. It’s just a solid business that makes my life so, so much easier. My box comes on Monday. I have until noon Sunday to add to or change my order so I just try to brainstorm about what I want to make for dinner before then. I scrape by eating whatever we have at home on Saturday and Sunday (and avoid the dreaded weekend grocery store trip!) knowing I can get any essentials I need on Monday from Door to Door. So, tomorrow I will put out last week’s empty box and wait for it to get swapped out with a full one. I mention them often in my posts and photos so I thought I would explain for anyone who may not be familiar. As a current customer, I can send you a code for $15 off your first box! Send me a message via my Facebook page (HERE) with your e-mail address and I’ll have a code sent to you ASAP. Have a good week! Every once in a while, the stars align — I get a recipe in my Inbox I think the whole family might enjoy and I happen to have all the ingredients. That happened recently with my weekly e-mail from Forks Over Knives. If you’ve never seen it, FOK is a documentary examining the belief that eliminating animal-based and processed foods from your diet can control or reverse most, if not all, degenerative diseases. Even if you don’t want to jump in 100 percent to a vegan diet, it’s a great film that might help you make better choices from time to time. I have no idea if this recipe is in the FOK cookbook, which remains packed up in my garage, where it’s been since I moved to a new home four months ago. Yet another reason I’m glad I took the time to open this e-mail. I’ve really enjoyed the recipes I’ve made from the book (including this Cheesy Baked Ziti I posted a year and a half ago) and will definitely make this one again. Next time I think I’ll jazz it up a bit — more spices and maybe even a diced fresh jalapeño. The original recipe has zero spices in it. I try not to mess with other people’s recipes too much until I’ve tried them, but I saw the blandness coming. I put just a dash of a few spices in. Next time, I’ll start with 1/2 teaspoon of each and likely go up from there. I’ll include them in the ingredient list below. Also, I’m sure you could easily substitute gluten-free all-purpose flour in this and it would turn out just fine. 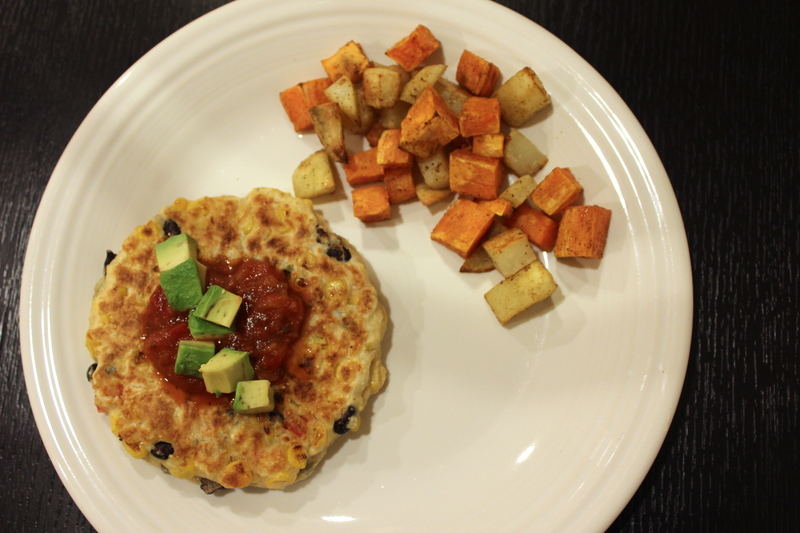 We topped ours with salsa and a little avocado. Next time I think I’ll definitely pick up some vegan sour cream. I served it with spiced roasted sweet and russet potatoes. 1. Preheat oven to 200 degrees F. I was roasting the potatoes, so I didn’t do this. Since you can only fit 2-3 cakes on the griddle at once (they are large) it might have been nice to keep them warm in the oven until we all sat down to eat. Really, wasn’t a deal-breaker though. 2. In a large bowl, whisk together flour, cornmeal, baking powder, salt and spices until well combined. 3. Make a well in the center of the mixture and add the milk, applesauce, pepper, corn, beans and onions. Gently fold the ingredients together until just incorporated. Don’t over mix. 4. Heat a griddle or large nonstick pan over medium heat until a few droplets of water jump in the pan and sizzle. You can always use oil, etc., but it’s really unnecessary if you have a nonstick pan. The key is to not touch them once added for a few minutes and you’ll be fine! 5. Spoon 1/2 c. of batter for each cake onto the pan, making sure they don’t touch each other. Cook until the undersides are crisp and they can be flipped easily without falling apart — about 4 minutes. 6. Using a spatula, turn the cakes over and cook until the other side is lightly browned and crisp — about 4 more minutes. The cakes are quite thick — I patted mine down a little, though I don’t know if it was necessary. 7. Transfer to an oven-proof platter or pan and keep warm in the oven until you’re ready to serve. Top with whatever you like and enjoy! 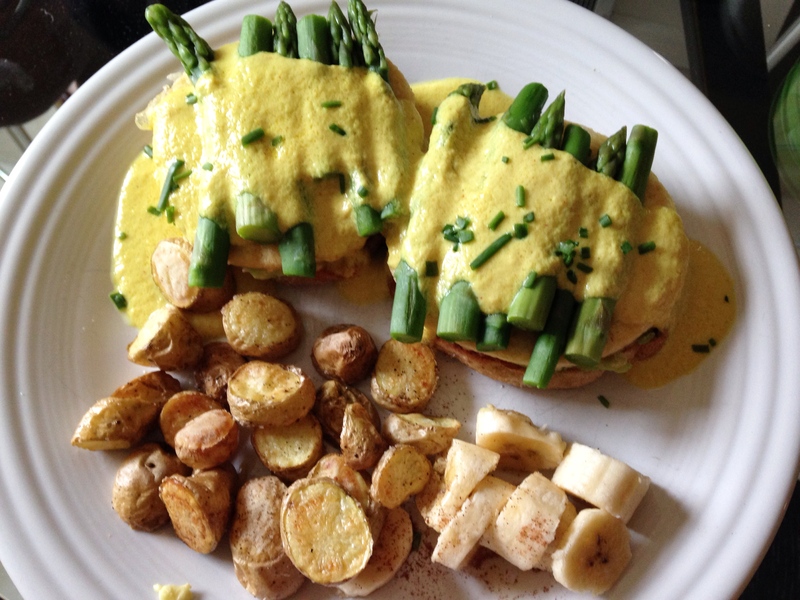 Hollandaise sauce has been a bit of a vegan kryptonite for me. I love it. I grew up eating it on asparagus and I’ve been known to eat just that for dinner in the summer when asparagus is at its best. My veg honeymoon (You can read Part 1 HERE. Sadly, Part 2 is yet to be written. Soon!) included a stay at Stanford Inn vegan resort in Mendocino, CA, where I had two amazing vegan meals each day. More than once this included vegan Hollandaise and I decided it was time I find a version I like. Well, it took two and a half years, but here you go. I’ve been making this version, from Vegetarian Times, for a few weeks now. I’ve made various versions of tofu benedicts and paired it with tofu and capers as part of an entrée. The original recipe calls for 1/2 c. silken tofu, but I triple it, which uses one whole package of it, then use it throughout the week. I’ve got a new addiction and I love that instead of eating butter and egg yolks, it’s tofu and other healthier deliciousness. I make it a little differently than the original recipe called for. Puree the tofu until smooth in the food processor. Add the rest of the ingredients except oil and puree, drizzling in the oil as it’s running. Transfer to a small saucepan and heat over low/simmer until it’s just warmed through and serve. Enjoy!